I am petrified of bikes. I know it may sound very strange to girls as chicks love being a pillion rider!! I feel really unsafe on a motorbike ( not that husband is a bad rider) but I simply avoid it. If you want wind in your face, go for a convertible; what's the need of a bike? Anyways I have rode for hardly 5 or 6 times till now. Once behind my uncle, once with my cousin and rest with my boyfriend ( now husband). However during this last trip of ours, I did not have much of an option. Our car had broken down and given the festival time, no mechanics were available. So instead of wasting time for the car to get fixed, I gathered up my courage and decided to go for a pillion ride exploring the unexplored suburbs of the city. We took the National highway 2 ( one of the busiest in India). So you can imagine how tough it was! Every time a truck sped past across us, I would pray!! He he..Anyways once I spotted lush green fields, I asked him to leave the highway and take the dirt road. Unpaved roads offer bumpy rides but they don't have trucks and are hence safer nonetheless. I had been longing to do a railway track photoshoot since many years. However railway tracks in India are not that easily accessible. And if they are, they are either very unsafe or dirty!! There is a railway crossing in the outskirts of Varanasi near a canal. Hubby took me there for pictures. Now the twist. That track is the main Howrah Delhi track which connects the Eastern part of India with the rest. So you can imagine how busy it is. There is a train almost every 5 minutes and the gates remain close for almost all the time.Was is worth taking such risk? The crazy blogger in me refused to give up. I got the chance after such a long time and wanted to utilize it. The gate was closed when we went on the tracks. Eyes were wide open as we could spot a train at any time. Hubby hardly took a couple of shots and then we ran. We watched the train go by after a couple of minutes. After that we saw so many of them. No wonder its one of the busiest railway routes of India! So much frolicking in the sun stimulated our appetites to a huge extent. There was a small shop near the railway crossing which was about hundred years old. 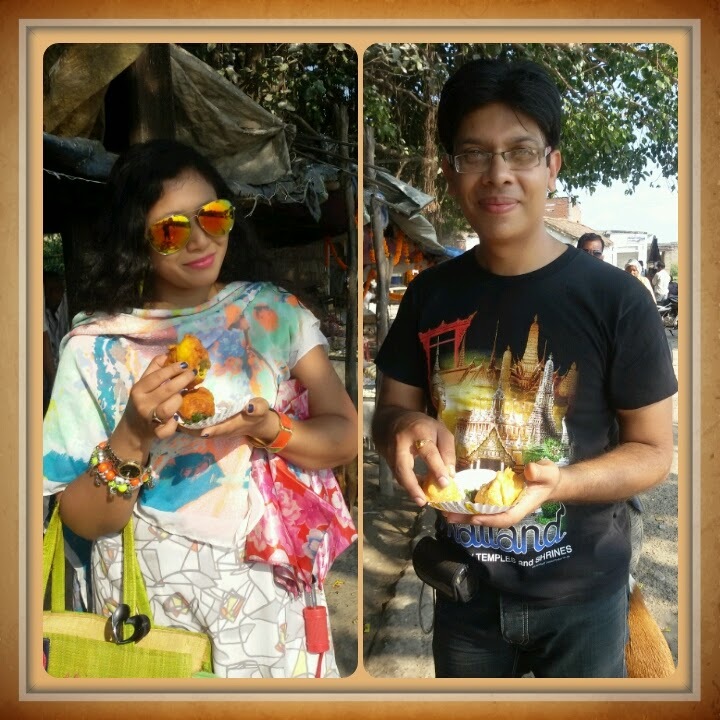 We gorged on deep fried snacks ( my favourite). After that it was time to leave. The sun was its terrible best. It was about 2 in the afternoon and the overhead sun had burnt both of us considerably. But I would say the ride was worth every centimeter of sunburn I had!! This the first time ever that I got clicked with buffaloes!! This is one of the busiest railway routes of India..the Howrah Delhi route...now you can understand what risk had been taken!! a busy route promised a picture with a train too!! 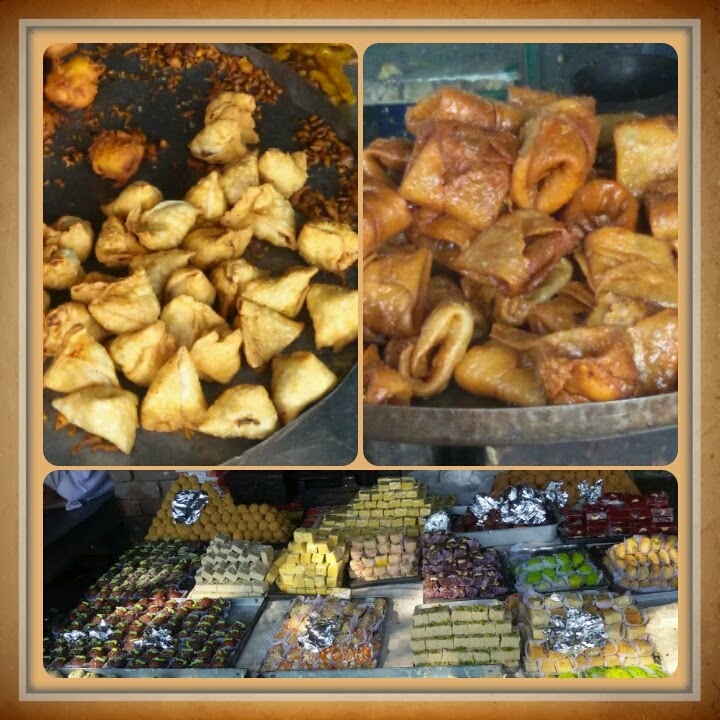 especially when the menu has samosas, 'laung lata' ( a famous Varanasi sweet) and a vast spread of sweets!! This is a wonderful story and love to read this Thanks. Great story! I love your sunglasses! There's is nothing in the world that would get me on a bike. You have been very brave. Glad you had so much fun. I loooove your beautiful dress. Happy Saturday pretty!! Loving your neon pieces. Looks like such a fun day! I am afraid of motorbikes too, but it also depends on the driver. Your sunglasses have the perfect shade! You look amazing great place to explore.